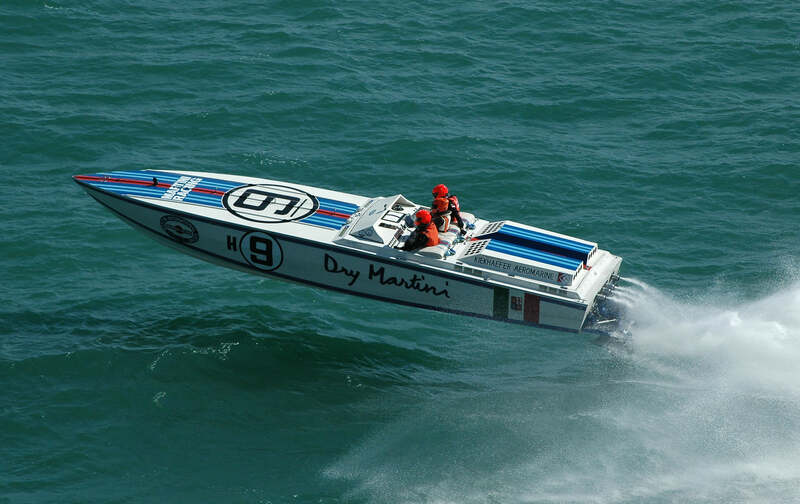 Richie Powers, seven times world power boat racing champion, is returning to help race the boat in which he won the 1974 championship, the Dry Martini (Cigarette 35). He will be part of the team taking part in the world’s most prestigious off shore powerboat race, the Cowes-Torquay-Cowes, now in its 57th year, which takes place on the 27th of August. Dry Martini will have a crew of three and will be driven by Christian Toll. Powers has also won the Cowes-Torquay-Cowes race on three occasions and set two world records, one for open class UIM Kilo of 158mph for a two-way run, with a top speed of 190mph. He has over 60 career victories and built and rigged most of his racing boats. The race takes place over the Bank Holiday weekend (26th – 27th August) and involves 18 boats, with teams from Belgium, Italy, Poland Ireland and the USA. It covers a distance of 190 nautical miles and the course speed record is 94.55 mph. The format is a bonus for powerboat racing fans as it provides a chance for viewing of the boats from Torquay’s Haldon Pier between the races. Access to the pontoons will be limited to officials and race teams but drivers will meet with spectators on the pier. There are also several vantage points on the headlands of the South Coast of England and Torquay Bay where fans can watch the boats both arrive in Torquay and race back toward Cowes. Race boats will then pass at speed in a convoy past the Snowden sailing mark before starting the actual race to the sound of the cannon between The Royal Yacht Squadron line and the north of Gurnard North Cardinal Buoy at 9:30am. At Torquay, the boats will form up and parade past Haldon Pier at 1.00pm before lining up for the race start back to Cowes at 2.00pm. Depending on the conditions the fastest boats should appear back in the Solent from soon after 3.00pm for a finish off the Gurnard North Cardinal Mark at Egypt Point, Isle of Wight. I am very excited to return to Cowes after 45 years, when I first went and won the race. To be part of the Dry Martini team, the boat I won my second world championship in 1974, is a very special event for me. It brings back a lot of memories. I have racing in my blood and this reunion with the boat I love, racing in the Cowes-Torquay-Cowes, it just doesn’t get better. Richie Powers is a legend in the power boat racing world. It is a privilege to have him in the Dry Martini team and I am sure he will make us faster! We are delighted to have him back where he belongs.